The Chad Valley Designabear Bumper Wardrobe Set is fantastic for stimulating amazing roleplay for your little one. 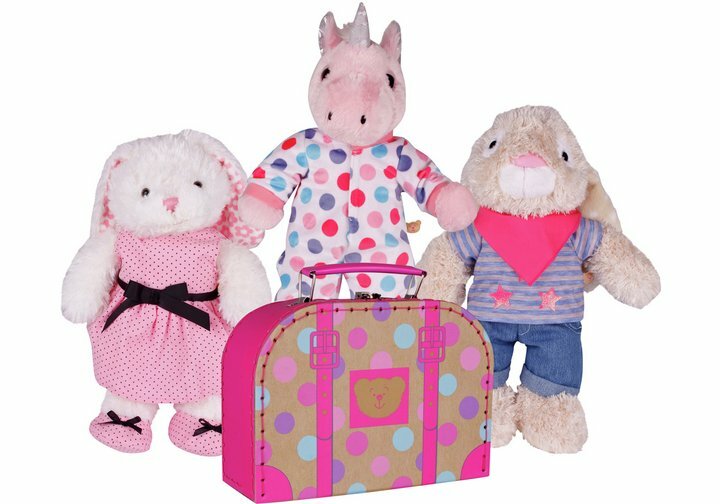 This printed card carry case with comes with three (3) outfits - a pretty pink spotty dress and shoes, T-Shirt with eye fetching sparkle stars jeans and cool bandana, plus a spotty zip-up all-in-one. A top tip is to mix and match outfits and accessories from your other Chad Valley DesignaBear pals to create even more unique looks! Get money off with April 2019 free Argos voucher codes, see if there's a promo code for the Chad Valley Designabear Bumper Wardrobe Set product. Argos may be out of stock of this product. To enhance your shopping experience you may also be redirected to a search results page when you click an outbound link.